Hello and thanks for joining me on my weekly Wednesday walk through the Lanternland factory! 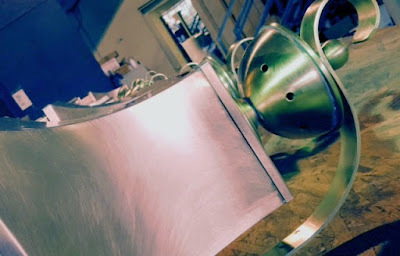 Over the coming weeks we will get to see many new lighting designs. Sometimes it will be a classic design, sometimes it will be a new variation on a classic design and sometimes it will be brand new design. First up is a new custom version of our Jackson Post Mount copper lantern with a specially tapered body. The standard version has a wide, rectangular body which gives it a very strong masculine look. This custom version has a more tapered body to give the lantern a more graceful feminine look. The 60W candelabra sockets were replaced with a single 60W medium base socket and a hurricane glass shade. 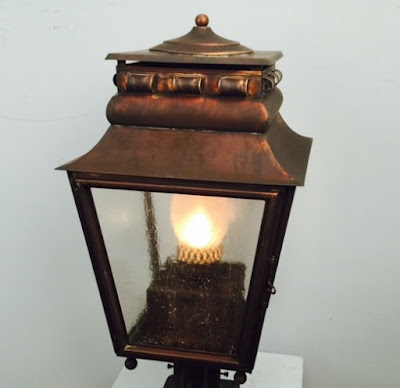 The beautiful Dark Brass finish paired with Seeded glass combine to give this lantern a traditional rustic look. Next up is our Weston Wall Light with Bracket copper lantern in our Raw Copper finish with Raw Brass accents, truly a beautiful combination of finishes and one of my personal favorites. Like all of our hand-applied living finishes, it is beautiful when first completed and looks even better as it matures and develops a natural patina over time. This classic Early American lantern design shows well on both traditional homes and upscale cabins.